SCVHistory.com LW2971 | Lebec | Early Snowfall in Lebec, October 1949. 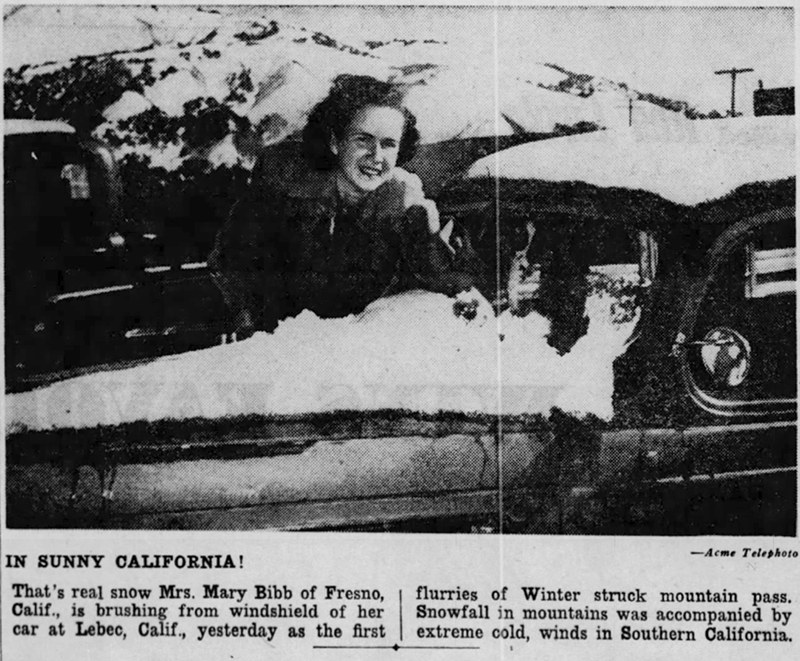 October 20, 1949 — Two women from Fresno trudge through a light snowfall that arrived early in Lebec. 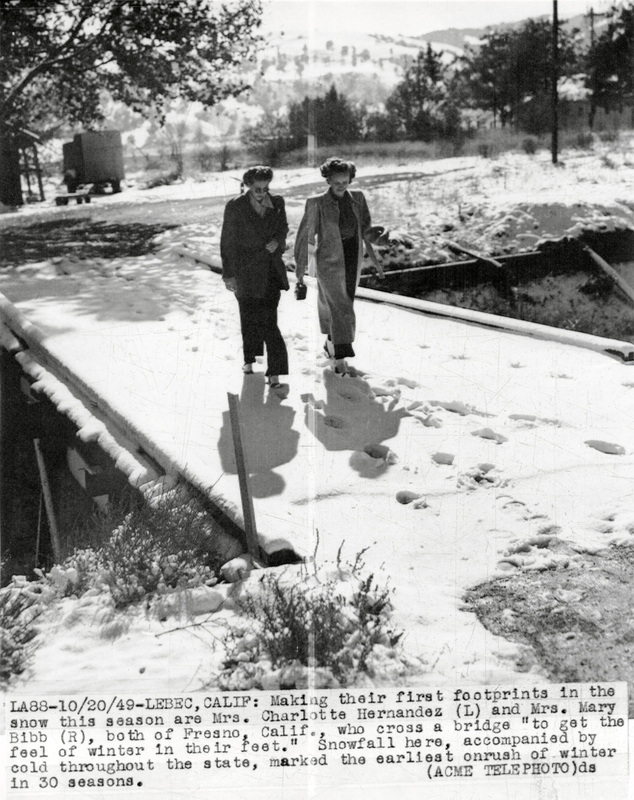 LA88-10/20/49 — Lebec, Calif.: Making their first footprints in the snow this season are Mrs. Charlotte Hernandez (L) and Mrs. Mary Bibb (R), both of Fresno, Calif., who cross a bridge "to get the feel of winter in their feet." Snowfall here, accompanied by cold throughout the state, marked the earliest onrush of winter in 30 seasons. With the early snowfall, local folks probably feared they were in for another heavy winter like the one the previous January that sent cars sliding off of the highway in the Newhall Pass and blanketed Southland beaches in snow for the first time in 18 years — but it was not to be. Los Angeles Times | October 21, 1949. Snow still mantled the Southland's peaks and lay in unmelted banks on the level at its mountain resorts, but the early cold snap may well be over today, the weatherman indicated yesterday. Temperature fell as low as 10 deg. at the Big Bear Lake dam, where about 2½ inches of a 4-inch snowfall remained yesterday. The U.S. Forest Service at Idyllwild reported a low of 18 deg. overnight although only snow patches remained in yesterday's sunshine. Rangers reported from Tahquitz Peak that 6 to 8 inches of snow still mantled the mountaintop with drifts up to 2 feet deep. There was a rush at Big Bear village early in the morning for radiator antifreeze and for blow torches to thaw frozen pipes, but less than 3 inches of snow remained on the level at noon when temperature was in the high 40s. Lake Arrowhead, which had about an inch of snow, reported most of it had melted. The death of Clinton Johnson, 75, of 1837½ W. 45th St., was blamed on the cold wave yesterday after Radio Officers R.L. Higgenbaugh and A.D. Hedricks reported finding his body in his home with all windows shut and a gas heater still burning. Police attributed death to asphyxiation, probably due to carbon monoxide poisoning. They had entered the home after an emergency call from a sister, Mrs. Margaret Cathers, of 205 S. Everest St., Monterey Park, who said she had been unable to reach her brother by phone. The officers said Johnson apparently was not aware of the dangers of lack of ventilation while using a gas heater. Frost caused little, if any, crop damage in Los Angeles County, agriculture officials said. The anticipated loss of vegetable and flower harvests from cold was averted chiefly because temperatures did not fall as low as first was feared. County Agriculture Commissioner Harold J. Ryan's chief deputy, Kenneth L. Wolff, said reports from crop observers scattered over the county indicated there was little firing in citrus groves and that cold spots, where temperatures as low as 25 deg. were expected, were several degrees warmer. At one of these, a large tomato gardening area near East Whittier, an observer reported a 37-deg. minimum. At the western end of the San Fernando Valley, temperatures ranged from 33 to 35 deg. between 3 and 5 a.m. One citrus district west of Canoga Park reported that a 30-deg. low there apparently did no damage. An Antelope Valley observer said overcast skies yesterday accompanied temperatures considered "not cold for the valley at this time" reporting that heavier freezes normally occur there even earlier. The Pomona area reported a cold spot south of town recorded 30 deg. at 1:30 a.m., and a degree lower at 5 a.m., but firing was not necessary and temperatures were not considered critical in that region. Snow still lay deep on Cuyamaca Peak, about 50 miles east of San Diego, but Highway 79, between Descanso and Julian, San Diego County, was reported reopened to traffic. The Cuyamaca area's 10-inch snowfall had set an early record for that mountain region. The 47-deg. downtown minimum made yesterday the coldest Oct. 20 since 1920 when the same temperature was recorded. The coldest Oct. 20 in Weather Bureau history was in 1886 when temperature fell to 43. New record minimums were set yesterday at Beaumont, with 30, and Oceanside with 41. Wind yesterday was abating along the Southern California coast line. The public still was barred from the Redondo Municipal Pier, but city officials there said there seemed no Imminent danger of its collapse. It should be slightly warmer today, the weatherman said. LW2971: 9600 dpi jpeg from original photograph purchased 2017 by Leon Worden.